On Saturday, I packed a goodie bag for Charlie, my favorite three-year-old. His eyes lit up with surprise, first spying Grover, Big Bird and the Cookie Monster on the very cool tote bag from Stemilt (which has a licensing agreement with Sesame Street's 'Healthy Habits for Life' program), then the just-polished Granny Smith apple, and finally the new story and activity book from Munch Crunch Bunch. "Does the Cookie Monster like broccoli, Charlie?" I asked. "Noooooo," he answered, as if uncertain, perhaps hoping. "Does the Cookie Monster like apples, Charlie?" I asked. "Yes!" he exclaimed, happy to find common ground with the Cookie Monster. "I like apples, too!" Ever polite, Charlie batted long lashes and said, "Thank you for the book and the apple, Mz Alanna." And you know, I think he meant it, truly. Stemilt and MunchCrunchBunch are commercial enterprises with profit motivation. But their strategies include promoting health and wellness among children, about making fruits and vegetables fun and cool. Three cheers to both. The MunchCrunchBunch activity book: Order the books online here. 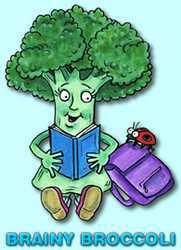 But for the first 12 people who write to JCWolterman AT aol DOT com with "I Like Broccoli" in the subject line, a free book will be sent to your home (be sure to include a name and address). 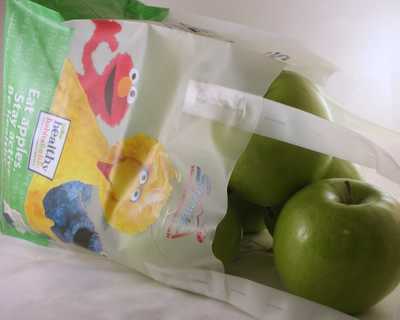 The Sesame Street bag from Stemilt: Check the produce section of your local supermarket. If you happen to be in St. Louis, I found the free bags tucked into the apples at Schnucks. Once again, thanks to Debbie, the produce manager at the Kirkwood store! I keep looking for grandchildren.